The modern Civil Rights Movement is often marked as beginning with the 1954 U.S. Supreme Court decision banning school segregation or the day in 1955 when Rosa Parks refused to move from a bus seat in Montgomery, AL and ends with the passage of the 1965 Voting Rights Act or with the assassination of Dr. Martin Luther King, Jr. in 1968 (Or, more recently, with the election of President Barack Obama). In some textbooks, the context for this movement are the years following the 1896 U.S. Supreme Court case of Plessy V. Ferguson in which federal and state laws enforced legal racial segregation, to which the Civil Rights Movement was a response. The contemporary “story” of the Civil Rights Movement is that bad things did, indeed, happen to innocent African Americans who merely wanted to live the American dream but that individual racist men were responsible for the violence and Dr. Martin Luther King, Jr., Rosa Parks and the federal government (including individual U.S. presidents) solved the problem. Textbook glossaries fail to define racism and the root word “race” (a concept debated by scholars); They define segregation benignly with little reference to the ways in which northern and southern state governments and businesses systematically – and over the course of several decades — reinforced an ideology of white supremacy through violence. Other groups of people affected by these same laws and practices – including American Indians, Mexican Americans, Asian Americans and Pacific Islanders, Native Hawaiians, Native Alaskans, Jews and Arabs – are seldom included in textbook discussions of racism. These absences strip away the underlying motivation for collective anger and social action. With the exception of Booker T. Washington and his public debates with W.E.B. Du Bois (who helped create the NAACP in 1909), there is little mention of the countless individuals and organizations in the first half of the 20th century who actively resisted white supremacist ideology and its practices such as lynchings, chain gang labor, sharecropping, the destruction of thriving business communities, and forcing people to leave town by sundown. 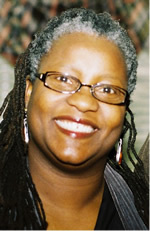 Rather than addressing the outrage of systematically being denied basic human rights by the U.S. Supreme Court, while citizens in a democracy, textbooks suggest that individual African Americans were merely sad or angry because individual white people did not want to fight wars, play baseball, learn, ride public transportation or eat lunch with them. Connections between the fight for racial and economic justice are almost never identified in textbooks, such that the enforced poverty of large groups of people, and their social and political exclusion, are justified by their own personal inadequacies, or solely because of the color of their skin. Any efforts to form labor unions or to join with poor whites (such as the Southern Tenant Farmers Union in the 1930s) to gain economic power are overlooked in textbooks. Nor is there mention of anti-racism activism in the decades since the late 1960s, in the face of actions such as the Rodney King beating in California, the MOVE bombing in Philadelphia, the Atlanta child murders, the Bensonhurst and Howard Beach beatings, Bernard Goetz and Amadou Diallo killings in New York City, and the Jasper Byrd dragging in Texas. A more accurate telling would address directly the long and continuing river of racial oppression in the United States, and the organized resistance to swim upstream, if not to redirect the river. What is called The Civil Rights Movement might be more accurately called the Modern Civil Rights Movement, or the African American Southern Freedom Movement, to distinguish it from other social movements for citizenship, self-determination, sovereignty, fair treatment, full exercise of the rights articulated in the U.S. Constitution and Universal Declaration of Human Rights, and the freedom to exercise the ensuing responsibilities, such as voting. 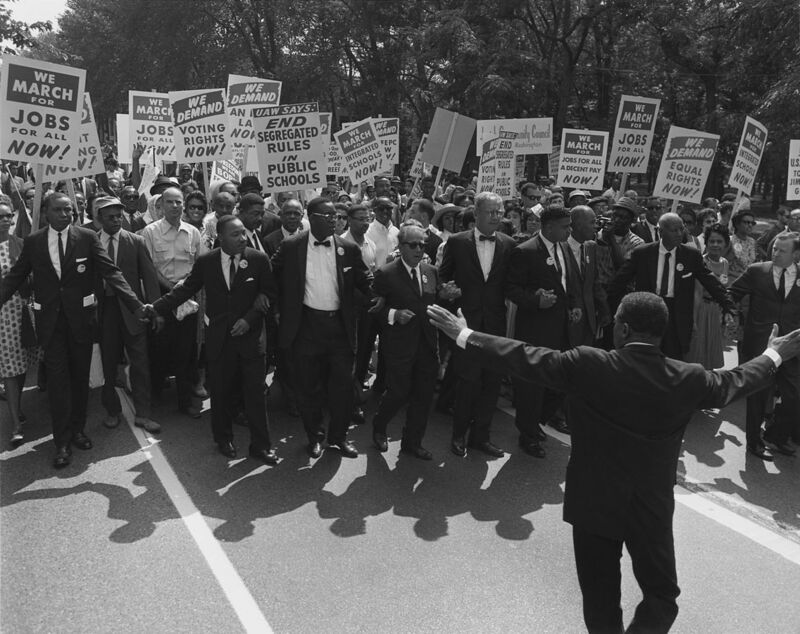 The 1963 March on Washington was the March for Jobs and Freedom, not the “I Have a Dream March.” The leadership of women and youth was essential in gaining important victories such as the Birmingham Children’s March of 1963 and the Voting Rights Act of 1965. The tedious task of organizing thousands of people to change their attitudes, behaviors, votes, and spending habits determined more successful outcomes than did charismatic individuals. Mid-20th century racism came in faces other than the white-sheeted Klan member and the law enforcement officer with attack dogs and fire hoses. The attempt to eliminate legal segregation was only one part of dismantling the continuing vestiges of institutionalized racism, and American culture was partially transformed for the good by these attempts. In analyzing textbook accounts of the modern Civil Rights Movement, readers would do well to ask: What were the women and youth doing during this event? What were the connections to other movements, either in the U.S. or in other parts of the world? What form of institutionalized racism was the target of a particular organizing strategy? How did culture (or a clash of cultures) influence the strategy or outcome of an event? What were the visible and invisible organizing steps taken to produce a particular action? Did Dr. King say more than four words and if so, what was he saying? Some answers to these questions might be found in primary sources such as the oral histories of the women activists featured in Hands on the Freedom Plow: Personal Accounts by Women in SNCC, Holsaert, et. al. (eds.) (2010), or the CD entitled Dr. King: War, Peace, and Poverty. However, the most important lessons of the modern Civil Rights Movement will not be gained from passively reading textbooks. 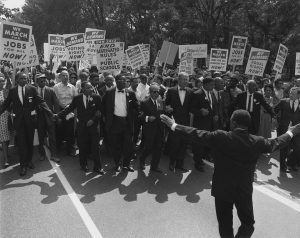 Examining primary sources will place students closer to the scenes of the modern Civil Rights Movement and its antecedent movements. Some examples of important primary sources are the evidence of sundown towns in Northern states (see Primary Source Sundown Town Signs), a letter from First Lady Eleanor Roosevelt regarding efforts to create a federal anti-lynching law (see Primary Source First Lady Eleanor Roosevelt’s Secret Letter ), documents from the Mississippi Sovereignty Commission and COINTELPRO (see Primary Source Documents from Secret Government Spy Operations), and the text of various state and U.S. Supreme Court decisions (see Primary Source Legal Decisions [1896, 1922, 1923]). More importantly, students will learn more by “doing justice” — by examining the ways that racial oppression is still alive in their community institutions and acting strategically with one another to create racial, economic, social and political equity. This entry was posted in Civil Rights, History. Bookmark the permalink.